I was over at a friend's house for dinner the other night and she had this poster ready to go up on the wall. I am so jealous! I want one for my kitchen wall and to proclaim my love for pork. Yes, I love pork in all it's forms from bacon, lard, prosciutto, ham, fatback, pork chops, pork jerky, pork dumplings etc. What's not to love about an animal that provides so many ways to be delicious. 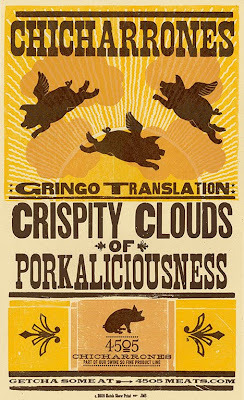 Recently my obsession is with Chicharrones from local Chef Ryan Farr which really are "crispity clouds of porkaliciousness." I have been buying them at every opportunity I get and eating them slowly so that I can enjoy all their porkaliciousness. Anyways, you can get this poster and learn more about buying Ryan Farr's Chicharrones here. hahahaha I love everything pork too. Chicharrones are a good 0 carb snack too.